Achieving conservation success is almost always the result of the actions and inspiration of one or more individuals who choose to make a personal difference and inspire others to join them. 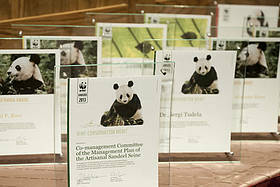 Through a range of awards, WWF seeks to recognize the individuals who make a significant personal contribution to the conservation of the natural world and sustainable development. WWF publicly celebrates these individuals and their achievements to profile their environmental leadership and the inspiring example they show to others. When added together, multiplied and magnified, these actions make a major contribution to secure the status of our living world ─ for current and future generations.